Recorded and mixed June to November 2003 at Uphon Studio. Except "Left Handed" recorded at Hausmusik. I love this album. The songs (in my opinion) show a real rebound from Scary World Theory. Powerful but ice-cool electronic pop. The production is top notch too. I never understood why the band went quiet after such a strong release. I'm very glad they're releasing more music. I'd better go out and get the new one! 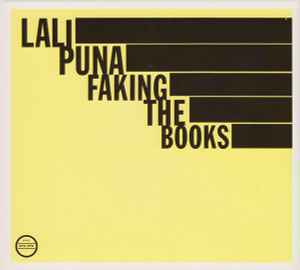 Lali Puna's love of beauty doesn't grow any weaker with FAKING THE BOOKS -- if anything, they've grown more into the pop rock suggested by earlier albums. The title track merges gentle guitar with Valerie Trebeljahr's plain and processed vocals, while "Call 1-800-Fear" and "Micronomic" have more of a straightforward, but dense rock sound. This album tends more towards upbeat than their other work as well, even if "People I Know" hints at Broadcast-like moodiness. For variation, "Geography-5" goes much more stripped down, and the closing track, "Crawling By Numbers" continues this. But perhaps the best merger of electronica and rock on the album is "Left Handed," which seems to best encapsulate Lali Puna's unique vision of pop.